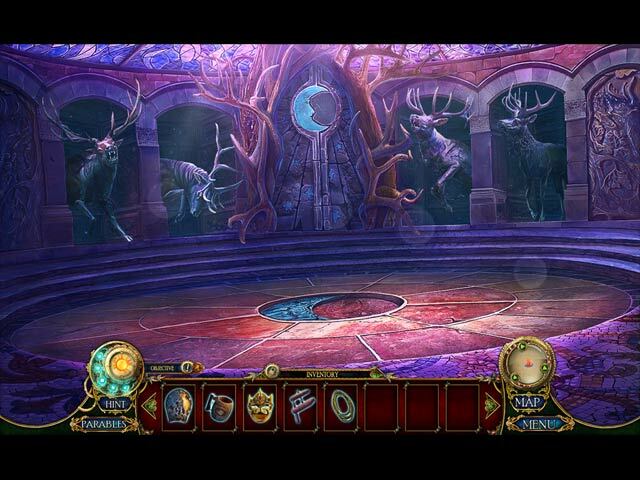 Rated 5 out of 5 by denniann2 from save the land of barsia you play as the fairytale detective. there is a custom level and a good hint system. the "fallen star" is all that will save the land from the queen that wants to destroy it. whoever has the "fallen star" will determine the future of the land. i liked it a good bit and i think others will too. i have played other games in the series and they don't disappoint. sequel.....i am sure. it is set up for it . Rated 5 out of 5 by Aliana_4711 from Nice story, finest art My rating is based on following: I like fairytales pretty much. Excellent graphics, pretty good animated, decent music and fitting background noises. Voices are really great and it was quite good spoken. Difficulty can be customized: I prefer playing w/o helping texts, so I enjoy this. You can delete the tutorial, decide if objectives and areas of interest are shown at an interactive map, chose contextual pointer, plusitem indicator, recharching time… Challenge was interesting enough, the objects are spread all about the locations, which makes it more interesting. The mini games aren’t not that new and could have been more challenging, but they are pretty good. The game hat a decent length at least. Minor dislikes: I'm not the biggest fan of FROGS, (finding all the pieces and game puts them together), I like interactive HO’s just fine, but this is a personal like. I did not use the interactive map often, but sometimes it does not lead to the current task. Rated 5 out of 5 by biscuitsmama from GOLDILOCKS, MECHANICAL BEARS AND A QUEEN WHO IS MORE THAN MEETS THE EYE This certainly isn’t the same Goldilocks story that I remember but I rather like the Dark Parables spin on the much loved tale. As usual you are a detective that investigates unusual occurrences and even when on vacation it seems that your help is required. A young boy tells a tale of being attacked by strange mechanical beasts but did that really happen? The thing is he has shown up with an artifact that might have been the reason for the attack. As you begin your investigation you too are attacked so there just might be something to the boy’s story after all. As you extract yourself from a dangerous situation and begin your investigation you find that there seems to be some sort of feud between the Barsians and the Olesians. The situation becomes even more tangled as you encounter your old friend Jack from the Sky Kingdom. As you step into Goldilocks and the Fallen Star, be aware that things are not always as they seem. The game includes four modes of gameplay: Casual, Hard, Insane and Custom. If you select the Custom mode the hints can be set to recharge anywhere from 10 to 120 seconds and the puzzle skips can be set to recharge in a range of 10 to 400 seconds. You have the option select what type tutorial you want, if any, as well as the option to turn off the of the HOP error click penalty if you don’t want to be penalized for random clicking in the HOPS. As usual the graphics are very good and the sound package compliments the game including the excellent voiceovers. The only thing I find disappointing with the change in devs of the Dark Parables games is that the FROGS now lack the richness and gorgeous color that was present in the original games. Your tools include an interactive map that is found early in the game. At least during the demo I did not encounter any gimmicky tools so that at least is a good thing. I do have a feeling though that the artifact I found early in the game may have some future purpose but hopefully it isn’t an item that must be charged by playing a mini-game before each use. I personally find those sorts of things nothing more than frustrating time-fillers to pad out a game but this is simply my opinion and others might not agree. The newer Dark Parables games include the traditional FROGS as well as HOPS. As I mentioned earlier the FROGS lack the luster of the previous games and seem dull by comparison. The HOPS are varied including the interactive story type where we must replace objects in the scene to open more of the story to ultimately receive our needed item. I actually didn’t care for the FROG scenes as the items were difficult to find mixed in with all the brown tones. Some items were hidden in dark shadows as well. Since the new team has taken over development of the series, I think it is time it disappears as it just isn’t the same. At least in the demo it seemed like there were a lot of mini-games and the ones encountered were fairly simple. One puzzle involved turning stones so that the runes on them were all visible, but turning one affected the adjacent runes as well. Personally, I dislike this type of puzzle and find them frustrating even though I eventually get the right combo. Another puzzle involved smelting bronze to create an artifact by following the instructions. The puzzles will become more difficult as the game progresses so I know there will be some to keep me on my toes. After the demo the puzzles did become better if not all that challenging but still better than insanely easy. 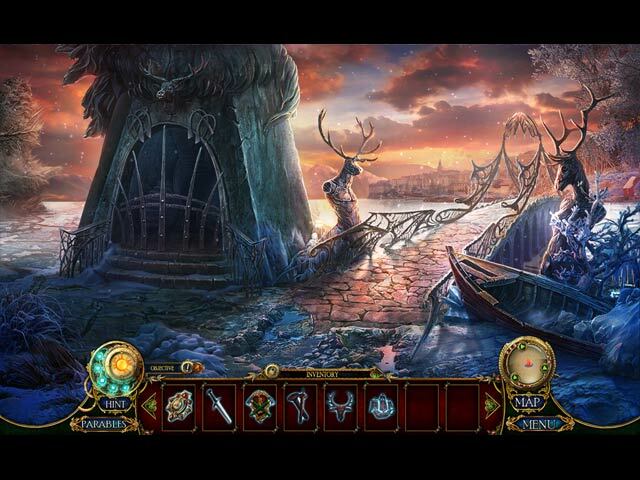 The CE version of the game contains collectibles – snowflakes as well as parable pieces. There are also those inevitable achievements to earn. The remaining extras include the Bonus Gameplay, Strategy Guide, Replay of HOPS and Puzzles, Wallpapers, Music, Movies, and Artwork. Generally this developer pack a lot into their CE releases so I am sure that looking for collectibles and morphing objects will keep me busy. Overall, I love the way this team puts a game together and am rarely disappointed. I had my doubts at the beginning of Goldilocks as it seemed to get off to a very slow start but it eventually picked up and I was disappointed when the demo came to an end. Again my only disappointment was with the HOPS. 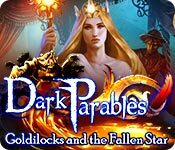 The game was a decent game and had some great gameplay features and had I not been a big fan of the previous Dark Parables games, this would have been excellent in my eyes. It is still a great game but just not really a DP game As always, I recommend that you at least try the demo to see if this is a game you will like. Rated 4 out of 5 by ninja226 from Should be renamed to Queen Valla and the Fallen Star The title of this game is very misleading. There is no connection whatsoever to the fairytale Goldilocks and the Three Bears and the storyline of this game. There is no Goldilocks character, but the heroine does have golden hair and a long braid. Bears are in the story, but not in any meaningful way. This story takes place in a Siberia-like land with roaming robots (automatons). Other than that, the graphics, animation, and special effects are superb. HOS is the usual Blue Tea special--finding fragments of one piece that come together to make one big ornately decorated object. The frags are difficult to find in some instances and well blended into other objects, so you may find yourself hitting the Hint button. Mini Puzzles are more challenging than previous games in this series, I skipped several of them. This is a long game, and one that would be enjoyed by more advanced Fishies who enjoy challenging puzzles and HOS. Rated 4 out of 5 by Kimmycoo from Beautiful Scenes I bought this game specifically for the scenery. Breathtaking backgrounds, just gorgeous. I found the game fun. I liked the story line, it was unique. I loved all of the trinkets, the HOS, mini games*(some were very hard) had to skip a few. Loved the music, sounds and voice-overs. Ive seen better games in gameplay BUT this had the most beautiful artwork as some of the top selling games do. Rated 4 out of 5 by jenjarrett from Enjoyable game I am surprised by negative reviews as this is a very well made, long enough, challenging enough (but not to the killer level) brightly painted, relaxing game. The story has nice little twists, the puzzles are more or less original and make you think while keep your sanity. The artists did a much better job on this one than on Little Mermaid where my eyes were bleeding at times. My only problem with this game was when I solved one of the shadow puzzles correctly, but the game refused to accept it :) I had to skip that one, and it was slightly annoying, but other than that, I enjoyed playing the game - more so, by the way, than some of the previous Dark Parables stories. Rated 4 out of 5 by deddu from Catch a Falling Star OR NOT! This game has 10 chapters to help you solve who is destroying Barsia. The hint button was a little awkward on the left side when you are right-handed. I'm not really a fan of the hidden object type in this game, i.e. finding all the pieces and game puts them together. There is a map but not very detailed, you can teleport sometimes and there is an objective list. Some of the mini-games were new to me, but I disliked the ones on the box -- too much repetition. Rated 4 out of 5 by themom101 from Great Storyline, but scant and misleading instructions signal a downward trend of this beloved series I own all the Dark Parables games in the series. It has become an almost "must buy".....until this one. I normally wait for the SE to be released. However, in the early Dark Parable games, the SE's were loaded with goodies and the CE version just added a bonus chapter. The SE's had the morphing objects, parables to complete, rich graphics, long play time.....just an all over great series. Since the new developer has taken over, the series has gradually lost the extras that made them a must have in my book. First, the morphing objects were taken out. Then the game play became shorter. And in this latest edition, there were several issues that bothered me. Some of the mini games had instructions that were either unclear, or missing all together. That wouldn't have been an issue if they were the usual selection of mini games since I'm an experienced player. But, the ones that had the least information available were totally new ones. And, they didn't follow any logical pattern that I could see. The game was fairly long, a decent length at least. But in this final installment of the series, not only have we lost all the extras that were offered in the SE's, we've now lost the parables to complete. There remains very little to resemble the original concept. Yes, they offer a twist on the fairy tales we know and love. Yes, the graphics are intense, and breathtaking. But as we lose all the things that made the series a great one, we're left with a run of the mill game that are a dime a dozen. Will I buy the next installment of the Dark Parable series? Probably, but it will only be after I play the demo, and only if my OCD tendencies kick in to make it "logical" for me to own all of them. Personally, I think Epix needs to go back to the drawing board and rediscover all the things that made the early installments so well loved. I hate to see a great series become mediocre. I recommend the game overall, but you should play the demo and make sure that it one you'll enjoy and not buy it just based on the series. Rated 4 out of 5 by pennmom36 from Goldilocks And The Mechanical Bear Well Detective, you've managed to get yourself involved in a war between two kingdoms! It looks like the little boy didn't cry wolf when he told the story of finding an ancient artifact, a malevolent queen controlling mechanical beasts, and the beautiful Princess Leda who has a golden touch! Queen Valla of Barisa, has rallied her people for the eminent war at hand, but she may have an ulterior motive, is this truly a righteous war? Jack has beat you to the scene this time, but he's looking for something entirely different, a Shooting Star to grant wishes.....is this a fairytale or a reason for war? I am disappointed, one of my favorite features in Dark Parables, have been the Morphing Objects. These were the really cool morphs, morphs that are triggered by a non-linear action that may not begin to morph until you are several scenes ahead, so you never knew! For whatever reason they have abandoned this feature, perhaps it's too difficult to program? At least they still have Parables! Parables are collectibles that tell a tale once all three sections of a Parable has been collected. The Collector's Edition has the addition of some very well hidden Snowflakes, 40 of them, and some of them are nearly impossible to find, the good news is that you get a chance to go back and find the ones you missed! 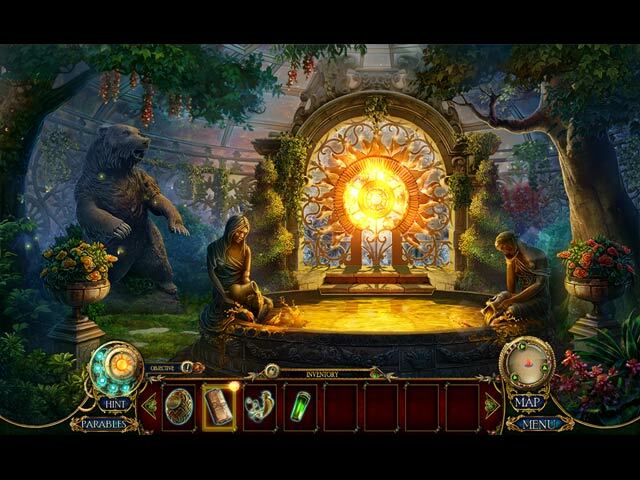 The Hidden Object Scenes are actually FROG's, a feature these games are famous for. The items you search for are actually fragments scattered cleverly about the scene. There are three different sections, and once you have found all the fragments the three sections will combine to give you the completed inventory item. The Mini Games are always a treat, almost everything in the land of Dark Parables requires finding emblems, including the puzzles. Below are brief descriptions of the puzzles you will encounter during the game: 1) Rotate ruin stones correctly, turning one stone affects others. 2) Interact with the scene of the story Goldilocks. 3) Move tokens to designated spots at the bottom of the board using only spaces with the same shape. 4) Rotate cylinders to create a path for three different shapes from right to left. The Collector's Edition has 8 Wallpapers, 6 Concept Art pictures, 9 Music Soundtracks, 21 replayable Puzzles, 20 replayable FROGS, 14 Movie trailers, 11 Achievements, 40 Hidden Snowflakes, Collectible Parables, a built in Strategy Guide and a Bonus Adventure (with bad boy Jack!) Enjoy! Rated 4 out of 5 by grapeleaves from Good game.!!! I did not Like Blue Tea. I was surprised Epic did it with them. I was glad not to see Blue Tea for some time. I don't like their concept of how they do the hidden objects that's all the rest is very doable. I just might purchase when I get a free game.